Experimental preservationists are upending old ideas about cultural heritage, choosing objects once considered ugly or unsavory, and usually excluded by official narratives. At the very beginning fantasy is not a substitute for reality but the first method of finding it. The words experimental and preservation have, until recently, been kept safely distant from each other. Experiment suggests the dangerous possibility of failure, something to avoid when working on valuable historical and cultural objects. To experiment on such objects is to risk altering the very qualities that make them valuable, and the failures are often publicly denounced. James Beck faulted Gianluigi Colalucci, Maurizio Rossi, Piergiorgio Bonetti, and the rest of the team that restored Michelangelo’s Sistine Chapel ceiling between 1980 and 1994, for over-cleaning and forever damaging the celebrated frescoes, 1 and John Richardson charged conservators from the Museum of Modern Art in New York with adding varnishes that effectively destroyed Cubist paintings by Pablo Picasso, Juan Gris, and others. 2 In these famous cases, preservationists were accused of committing “crimes” against culture, a serious indictment suggesting transgression of the laws and conventions that protect cultural heritage. The stakes are high for experimentation when even slightly altering the microscopic surface of an object can be tantamount to ruining it. ‘Experiment’ suggests the dangerous possibility of failure, something to avoid when working on valuable historical and cultural objects. Nonetheless contemporary practitioners defend the need to experiment as necessary for advancing the knowledge of objects — and indeed for protecting their future. But as Erik Langdalen, of the Oslo School of Architecture and Design, points out, this embrace of experimental methods is tempered with caution, self-criticism, even self-doubt. 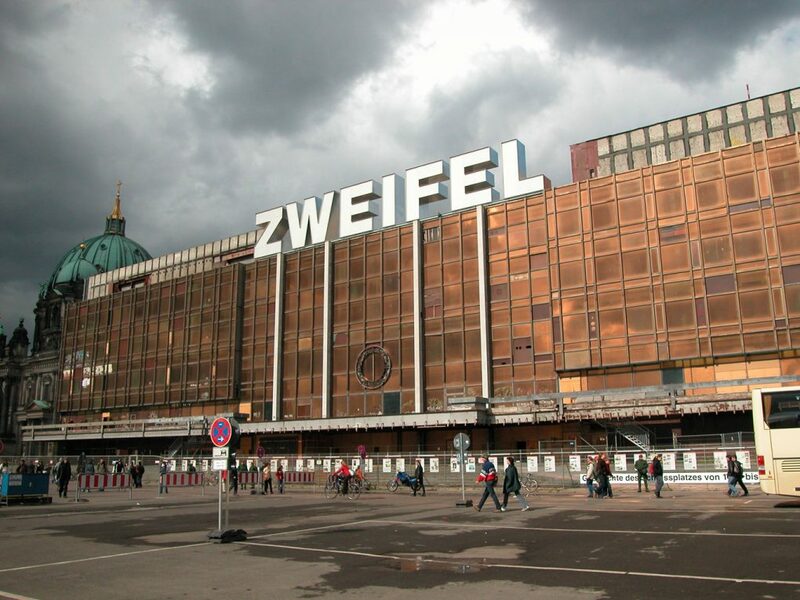 Lars Ramberg’s temporary project from 2005, Zweifel, mounted atop the now-demolished 1976 Palast der Republik in Berlin, expressed this doubt literally, in its very title. These preservationists do not celebrate experimentalism for its own sake, as modernist architects, artists, and scientists once did. 3 Rather they put forth experiments that interrogate conventional ways of preserving objects and offer alternatives that, while practicable, reach beyond institutionalized modes. And they often come to preservation from different disciplines — art, architecture, engineering, history, data science, material science, philosophy — bringing with them novel methods. They are simultaneously outsiders and insiders. Adam Lowe, one of the founders of the collaborative Factum Arte, has pioneered what he calls “non-contact” experimental techniques which both digitalize material objects and rematerialize facsimiles. Lowe, trained as an artist, suggests that one can alter an object without even touching it, by multiplying it; and he proposes an expansive understanding of object, as something enmeshed in networks of social relations, media representations, political manipulations, and technological multiplication. Philosopher Johnny Golding describes this field of exchanges between people and things as a “surface,” and suggests experimental preservation needs a “surface methodology” in order to document, understand, and intervene upon objects that are not enclosed by physical boundaries but rather expand across a spectrum of the tangible and intangible. ‘Preservation’ has come to be associated with a sort of deference to the past over the needs of the present. The word preservation is no less problematic. It has come to be associated with a sort of deference to the past over the needs of the present that subjugates contemporary action, normalizing and confining it via legal regulations and thwarting alternatives to the status quo. Experimental preservationists question the longstanding identity of preservation with the governmental protection of cultural objects, and the largely unquestioned narrative that preservation bureaucracies always act for the common good. 4 The Turkish artist Tayfun Serttas has even argued that there is no cultural heritage, only political heritage created by regimes whose goal is to consolidate and perpetuate their own power. His 2014 installation, Cemetery of Architects, consisting of plaques and cornerstones with the names of late 19th-century non-Muslim Turkish architects whose buildings have been systematically demolished, is clearly an instance of political resistance and an effort to visualize an alternative and more cosmopolitan future for Istanbul. The objects of experimental preservation are often markedly different from those of governmental projects. Cultural historian Laurajane Smith describes the usual official choices and the ideology that supports them: “The Authorized Heritage Discourse focuses attention on aesthetically pleasing material objects, sites, places and/or landscapes that current generations ‘must’ care for, protect and revere so that they might be passed to nebulous future generations for their education, and to forge a sense of common identity based on the past.” 5 In contrast, experimental preservationists guard their freedom to choose objects that might be considered ugly or unsavory, or unworthy of preservation, objects that might have been ignored or excluded by official narratives, perhaps because they embody the material, social, and environmental costs of development which governments and corporations seldom account for. For instance, in recent projects the architects Reinhard Kropf and Siv Helen Stangeland have chosen to preserve waste — something that appears to have no value but in fact has great social potential to make communities more visible to themselves. In this line of thinking they are influenced by Michel Serres’s notion of the quasi-object, famously illustrated with the example of a soccer ball: Serres described how the ball participates in and co-produces the human interaction we call soccer. It is simple to visualize: without the ball there is no game. But the ramifications of this understanding of objects are profound. Quasi-objects can interfere with how we play the “game” we call society, how we structure our interactions, collect ourselves into groups, distinguish ourselves from others, identify our culture. Without quasi-objects there is no social game, no cultural difference, no shared experience. That experimental preservationists tend to choose objects not considered worthy of traditional preservation raises the question of whether the old intellectual frames — the criteria used to assess the value of historic resources — will be fit to analyze these unconventional objects. Some criteria, such as “historical significance,” were established in the late 19th century. Which does not mean these old ideas are not valuable; but they were created in an era when much of what defines our contemporary environment hadn’t been developed or didn’t even exist: electrification, cars, films, computers, digital codes, plastics, wearable technology, smartphones, smart buildings, robots, satellites, and so on. How then can we bridge the distance between these older ideas and values and the new material world? Lucia Allais’s work suggests that quasi-objects not only affect how we socialize; they can also encourage interventions that help us modify old preservation criteria. To make this point, she chose, for her project Legible Pompeii Monditalia — a collaboration with MOS Architects for the 2014 Venice Architecture Biennale — an unusual object to preserve: epoxy resin, the quasi-object used to bind historic buildings together and as such an essential part of the preservationist’s palette. Epoxy resins have been injected into heritage objects around the world, from the temples of Abu Simbel in the 1960s to the more recent restoration of Tullio Lombardo’s late 15th-century Adam. 7 Typically they are considered supplements, secondary to the object being conserved, and meant to remain invisible. In this project Allais and MOS reverse the convention, making epoxy the primary object, using it to form bricks that encase, in the words of their project description, “ersatz Pompeiian matter.” Following the traditional role of the historian on a preservation team, Allais remains at arm’s length from the physical handling of materials — from the architectural aspects of the project — which become the purview of MOS. Allais and MOS thus spotlight conceptual work as intrinsic to experimental preservation: the expanded object both enables and is enabled by an enlargement of the intellectual frames of heritage. British photography conservator Simon Fleury sees new and old objects as entangled — though without necessarily touching. Fleury, who works at the Victoria & Albert Museum, focuses on images of heritage objects, such as photographs of the Raphael Tapestry Cartoons, and their role in conditions reports. These particular images — composites of mounted silver gelatin prints with an acetate overlay that shows the conservator’s annotations — are working photographs never meant to be exhibited. The annotations describe the object’s state of decay: the fault lines where the Raphael Cartoons have weakened, the areas where they have faded. But the conservator’s photographs do more than depict the object; they cast it in a new light, with the marks of decay raising provocative questions. Why did the tapestry fade here but not there? Did people touch that part of the artwork? Or did moisture in a wall cause mold to grow on the canvas? Why was there moisture in the wall? Was there a bathroom on the other side, or did poor flashing on the facade let water into the building? Typically the conservator’s analysis remains unseen, hidden from the public so as to not distract from the enjoyment of the original artifact. But Fleury invites us to consider this technical work along with the Raphael original; he invites us to view the object not as a discrete entity but rather as an expanded object participating in a wealth of environmental, social, temporal, and authorial relationships. Experimental preservation thus critically reevaluates and often challenges disciplinary conventions. The starting point is doubt. Experimental preservationists choose objects in order to test their potential as heritage — to verify or refute hypotheses about their capacity to become valued objects we cannot imagine future generations living without. The process of both choosing and doubting is expressed in the sign Lars Ramberg mounted atop the Palast der Republik — “Zweifel” is German for “doubt.” Closed to the public since the reunification of Germany, in 1990, and stripped of its interiors by 2002, the Palast der Republik had sat empty for over a decade. For many former East Germans, the future seemed inconceivable without the “people’s palace” of the old GDR, the place where the Socialist Party had assembled and where cultural and scientific events had happened. For some former West Germans, the building and its Communist legacy were aberrations; they wanted the mid-20th-century structure demolished and replaced with a replica of the Baroque castle that had stood on the site until it was badly damaged by bombing during World War II. “Every day Germans are told by our leading politicians to ‘look forward’ — which essentially means backward,” wrote preservation historian Adrian von Buttlar, “It seems we need a proper past for our future. But which past?” 8 In choosing between buildings — the socialist palace or the Baroque castle — Germans were really choosing between futures. Ramberg’s Zweifel provides an important insight into how experimental preservationists express their choice of object. Ramberg chose an object; but his choice was tentative. The sign invites us to consider whose doubt is being articulated. The artist’s or the viewer’s? The individual’s or the public’s? The sign is a solicitation of collective thinking about the building, yet it makes no assumptions about the validity of different viewpoints. Ramberg’s choice, in other words, is expressed as a hypothesis about collective value and public significance; his sign is an appeal, an urgent request for the public to test the hypothesis. It’s notable that Ramberg deployed a basic aesthetic convention of preservation — he affixed a plaque to a building. 9 And he made the plaque so large that it’s possible to photograph the entire building and the plaque all at once. Ramberg also made his project mobile phone-friendly, adapting to new modes of expressing collective affinities while encouraging deeper interaction with the building. This was the crux of his appeal to the public to consider the building as heritage. The public of course could not answer directly because it doesn’t speak, as such; it is everyone and no one. It could only answer indirectly, through how the building became enmeshed in the socio-technological system of perception, communication, and collective action we call contemporary culture. Ramberg’s hypothesis tested the value of the building and showed that it possessed public significance that official planners were unwilling to recognize. Experimental preservationists choose objects in order to test their potential as heritage — their capacity to become valued objects we cannot imagine future generations living without. Heritage objects by definition represent not individual preferences but collective choices; and in their choice of objects, experimental preservationists do not attempt to speak for culture but rather to solicit a cultural response. With Ramberg’s example in mind, we can further unpack just how this cultural response is articulated; we can begin by turning to sociologist Pierre Bourdieu, who described cultural production as a social game in which each player (the master, the student, the critic, etc.) has a specific position, and in which each interaction is governed by specific rules and possible moves. 10 The key point is that we can step into and out of these positions. In the morning a Native American might put on her traditional dress and participate in a ceremonial ritual; then change into jeans and spend the afternoon shopping at the regional mall. What Bourdieu’s analysis didn’t dwell upon, but what we might add, is a focus on the importance of objects — the dress; the jeans — in enabling us to move from one cultural position to another. Just as without the soccer ball there is no game, without objects there is no field of cultural production. No wonder that every change to the design of the ball changes how players move and how the game is played — for example, the Brazuca ball, designed by Adidas for the 2014 Brazil World Cup, was literally a game changer. Together the work of Bourdieu and Serres suggests that we can understand experimental preservationists as players in the game of cultural production whose position is to produce new quasi-heritage objects, each with the potential to change the game. One of the chief misunderstandings of preservation is that heritage objects are already out there in the world, awaiting the recognition of experts. In fact preservationists have always played an active role in choosing — even co-creating — heritage objects. But their role is often unacknowledged, sometimes deliberately concealed. Preservationists actively choose heritage objects. Historic districts did not exist before preservationists conceptualized them as a new type of heritage. Experimental preservationists choose objects which are already out there in the world but for whatever reason have dropped out of contemporary culture and do not circulate in our everyday exchanges. In essence, experimental preservationists recognize an inherent potential, new latencies, within canonical objects. Their choices — which, again, can be proved or disproved only by the larger public — are wagers that others will see reality as they do. In the Anthropocene, cultural production has become a form of natural production. Today, these 19th- and 20th-century theories are interesting but not urgent. Today the crucial questions are no longer framed in theological terms, as a meddling with God’s plan; the debate has shifted to biotechnological terms, as we have started to manipulate human DNA, and as our understanding of climate forces has evolved. Especially with the emergence of climate science in the late 19th century, the weather slowly ceased to be seen as an agent of “natural” decay against which we were helpless. 17 We now understand that human-caused pollution is altering planetary weather to such a degree that we have entered a new geological era: the Anthropocene. Cultural production has become a form of natural production. 18 Climatologists warn that environmental degradation is irreversible: even if we were to stop producing pollution, the damage has been done. And for the first time in history, climatologists are now predicting the deep future as well as tomorrow’s weather. Yet between these temporal spans — between a near future of days and weeks and a far future of centuries — lies the future we measure in decades, in life spans and generations. Climatology has relatively little to say about this generational future, and other relevant knowledge seems necessary — specifically the knowledge experimental preservationists bring to bear on the world. More recently, Laurajane Smith has criticized the so-called Authorized Heritage Discourse produced by organizations like UNESCO in order to establish top-down criteria for choosing objects according to “universal values.” Smith argues that such criteria preclude the possibility of these values evolving over time, and therefore also preclude the possibility of people freely choosing their own objects, a situation further aggravated in the case of disenfranchised people. 22 Jameson and Smith are indebted to Michel Foucault’s influential critiques of normative discourses, from sexuality to criminality, and, like Foucault, they use discourse analysis to show how social institutions codify human experience in order to normalize and control it. All of which raises key questions: is it possible to reify the present — to choose our objects — more directly by developing a more critical discourse that will help us to freely grasp our human experience? To what degree can the experimental preservationist’s choice of objects be considered free from institutional and state mediation? Practitioners are now grappling with these questions via new testing methods which draw on discourse analysis but also incorporate lessons from ethnography, anthropology, and psychoanalysis. The Bosnian artist and historian Azra Akšamija is exploring these issues in projects that blend preservation, art, and ethnography. How, she asks, do people use cultural objects to reify the present in places like the former Yugoslavia, where states have either vanished or abdicated their duty to care for cultural heritage? Akšamija belongs to the generation that came of age as the communist world was breaking down in the late ’80s and early ’90s. For this generation the Marxism of Fredric Jameson — based upon an older world order of advanced Western economies with durable, albeit weakened, state structures — has been minimally useful. In contrast, from the breakup of Yugoslavia to the creation of new states in the Balkan Peninsula, Akšamija and her compatriots have experienced a very different context of shifting national borders and authorities. For her recent project, Future Heritage Collection, Akšamija asked the residents of Sarajevo, capital of Bosnia and Herzegovina, “to become collectors of their own cultural heritage” — to gather and bring to her objects meaningful to them. Respondents showed up with the mascot of the 1984 Sarajevo Olympics, a Soviet photo camera, a map of old Yugoslavia and the Balkans, and other artifacts associated with Soviet times. These choices cut against the grain of the official state narrative — the narrative of clean political rupture with the past. 23 From the perspective of Bosnia and Herzegovina, these Yugoslavian objects do not exist; and more, the obligation to account for them belonged to a nation that no longer exists. What is at stake in Akšamija’s effort to account for the chosen objects? Carrying a clipboard and pad — and fortified with irony and humor — Akšamija impersonated a preservation bureaucrat laboring to document every received object into a pseudo-official register called the “Future Heritage Collection.” Akšamija’s performance, the fake but convincing protocols of her project, make painfully clear the biases and shortcomings of the new state, which has established no preservation authority capable of documenting, let alone storing and conserving, the objects that constitute its heritage. For the next and still more powerful stage of the project, Akšamija dressed up as a future archeologist who finds fragments of these objects — artifacts never accessioned into state collections, with no provenance, no history of associations or interpretations — and cannot make sense of them. Confused, she magically beamed back to the present to seek explanations. What, for early 21st-century Bosnians, is the meaning of the 1984 Olympic mascot? Akšamija’s performance is comic but her question is serious. Ultimately her project argues that the state’s failure to account for these objects — for its heritage — will shape how our present is understood and remembered. Our reality will look different because of the disconnection between the objects Bosnians are choosing and those being chosen by the state. Without state financing, the intergenerational endurance of intangible heritage would be hard to imagine. What this approving discourse downplays is that Shinto is Japan’s state religion, and that the high annual costs (approximately 55 billion yen, or half a billion dollars) of rebuilding Ise are paid mostly by taxes (either directly or through incentives). In fact, without state financing, the intergenerational endurance of the quasi-object called intangible heritage would be hard to imagine. In this light the argument of Azra Akšamija’s one-woman pseudo-preservation bureaucracy is sharper than ever. Without state investment our choices are inevitably precarious; the present we might want to reify will not have the staying capacity to be carried over to unborn generations. Her work challenges the hypothesis that our “normal” experience of choosing heritage objects can ever be free from state mediation. In another project, Culture Shutdown/Solidarity Day, she called upon museums around the world to ban access to one of their works in order to shame the government of Bosnia and Herzegovina into reopening the National Museum, in Sarajevo, which was closed in 2012 due to lack of funding. 26 Akšamija wants the state to acknowledge its obligation to care for the cultural heritage that its citizens value. To her, the silence of the state is maddening. Let’s now examine experimental preservation in light of the relationship between madness and reality. For it would be fair to consider experimental preservationists mad if we could show that they do not share the same grasp of reality as the rest of society. Psychoanalysts have established that for sane people to perceive a thing as real others must also perceive the thing as real; in other words, our sense of reality is socialized. The English pediatrician and psychoanalyst Donald Winnicott (1896–1971) provided the first convincing empirical evidence of this phenomenon. Winnicott was also the first psychoanalyst to seriously examine children and question them about their experiences. (Freud, in contrast, asked his adult patients to recall their childhoods.) Winnicott studied the process by which infants grasped the existence of an external world. Early on infants experience the food and care they receive as wholly internal: by adapting to the child’s demands, providing her breast whenever the baby cries, a mother nurtures the illusion that her breast is part of the baby. “The mother’s adaptation to the infant’s needs, when good enough,” Winnicott wrote, “gives the infant the illusion that there is an external reality that corresponds to the infant’s own capacity to create.” 27 The mother must then progressively disillusion her growing child, gradually adapting less to the infant’s demands; at which point the frustrated infant will start gently to discover that there is an external world beyond his or her control. Winnicott’s major discovery was that objects play a central role in this complex process. As the mother disappoints the child, the latter turns to an object; often this is a favorite doll or blanket, but really it can be anything which serves as a cherished defense against anxiety and frustration — and which compensates for the lost illusion of creative omnipotence. Winnicott discovered that objects are central to the complex psychological process of socialization. What’s especially important is that the child chooses the object. Anyone who has observed children knows this choice cannot be challenged. It must be the teddy bear, and no other. No matter that the doll is getting old, stained, and smelly; washing is out of the question because this would introduce, as Winnicott writes, “a break in the continuity in the infant’s experience, a break that may destroy the meaning and value of the object to the infant.” 28 And if the object is lost, nothing else will do. “Good enough” parenting, as Winnicott called it, requires that adults recover the cherished object that comforts their child — even if it means a long trip back to where they forgot it. What is key here is that the child’s chosen object allows not only for the benign frustration of new anxieties but also for the formation of new experiential relationships to things as existing beyond one’s inner world. In psychoanalytic parlance, the object enables the child to engage in safe “reality-testing.” Significantly, the testing involves social relations. It is the changing behavior of the parents toward the object that confirms or frustrates the child’s illusion and growing ability to recognize and accept reality. Through objects, children learn to “ask” their parents a question they can neither articulate nor pose directly: What is and isn’t real? Winnicott coined the term “transitional object” to identify this special object that assists infants in testing and experiencing the difference between inner and outer worlds. He described this object as “the first not-me creation.” (One could draw a comparison between Winnicott’s transitional object and Serres’s quasi-object. Both attempt to describe how objects enable us to socialize, and how social relations are in part accommodations to objects.) And the need for transitional objects, Winnicott concluded, does not end with childhood. Adults also require “an area of experience that is not challenged,” that can “exist as a resting place for the individual engaged in the perpetual human task of keeping inner and outer reality separate yet interrelated.” 29 Winnicott didn’t elaborate on the sorts of transitional objects chosen by adults, save from passing references to art and religion, which he saw as realms of experience where illusion was not only socially acceptable but also carefully protected. And, of course, art objects and religious objects lie at the core of what we commonly consider cultural heritage, worthy of preservation. Winnicott saw art and religion as realms of experience where illusion was not only socially acceptable but also carefully protected. Viewed through Winnicott’s theories, preservation appears in a new and unusual light: as an unchallenged area where we can safely experience cultural objects as vitally important to us — where we can experience ourselves as part of cultural objects and even feel that we exist only to the degree that our heritage survives and that without this heritage some vital part of us would die. Preservation allows us to feel as if our lives depended on the survival of our native land or historic neighborhood. Preservation also encourages us to gather into social groups — cultures and subcultures, if you will — on the basis of this illusory experience of objects. We can even express this experience in public without anyone seriously questioning it (or questioning our sanity). Preservation thus plays an enormously important social role in shaping reality, providing a safe realm of experience where adults can experiment with not-me creations as things both theirs and not-theirs, both individual and collective. Preservation allows us to feel as if our lives depended on the survival of our native land or historic neighborhood. It is through the act of choosing cultural objects — in a sense, creating them as heritage objects — that preservationists help to provide that safe realm of experience. But there’s a limit to the capacity of preservationists. Again, cultural objects cannot be definitively chosen by individual people; ultimately the choice belongs to society. In other words, by choosing cultural objects and (say) placing them on national historic registers, preservationists are in effect posing a question: Is this object real? The answer to this question will emerge only indirectly, over time, through how society treats the object, through whether or not it provides a successful environment for its endurance. Preservationists are always trying to persuade the larger culture to provide a successful social environment for their not-me creations — a social milieu where the illusory experience of culture reified into tangible and intangible objects goes unchallenged. Sometimes they get away with it and produce amazing new things, like historic districts and view corridors. Sometime their choices are challenged. The Dresden Elbe Valley, for instance, was listed as a World Heritage Site, an “outstanding cultural landscape,” in 2004, only to be delisted in 2009 when a new highway bridge was constructed through it. 30 Preservationists’ not-me creations can be seen as a call-and-response with society, a back-and-forth process through which we all explore the potential of cultural objects to be considered real. But preservationists know they cannot make too heavy a claim and force others to acknowledge an illusory experience that is not their own. To do so, Winnicott reminds us, would be a mark of madness. Preservation is central to every cultural institution. An institution is by definition a society organized around a particular object: a religious institution is organized around religious objects, art institutions around art objects, cultural institutions around preserved objects. I purposely insist on the centrality of objects because, from a nonbeliever’s position — an exterior position — that is simply what these institutions are about. However, from a believer’s position — an interior position — these objects constitute a protected realm in which religious experiences, art experiences, and heritage experiences can be safely explored. Which is to say that social groups form institutions precisely in order to protect these realms of illusory experience from external threats. The Catholic Church defends the experience of the Holy Host through the ritual of a wafer of bread. The Museum of Modern Art defends the experience of the artist’s subjectivity through the exhibition of paint on canvas. UNESCO defends the experience of intangible heritage in the whistling language of La Gomera. Notice that Bourdieu describes the illusio as both social and psychological. Again, it is through the experience of illusion that we forge a common sense of reality, a shared recognition of all the objects (in the widest sense of the word) we take to be real: tangible objects like art and buildings, intangible objects like oral traditions or number systems, and also people and even society itself. Bourdieu’s use of the term illusio comes very close to Winnicott’s description of the realm of unchallenged childhood experience in which reality is socialized and affinity groups are formed. Their choice of word is important: illusion suggests deception, a distorted sense of reality. More troubling still, it implies belief in the deception. Bourdieu and Winnicott interpreted the origin and function of this belief differently. For Bourdieu, belief comes mostly from outside the subject. In his view belief is institutionally curated and maintained, from the top down, to maintain a social order that benefits those on top. It functions as an idea that can mobilize actors across the social spectrum in the service of an established order — and even enlist the disenfranchised in the perpetuation of their subjugation. Bourdieu’s focus on how the belief in illusion can produce social inequity prompted him to critique that belief to advance a more just society. For Winnicott, belief in illusion comes mostly from inside the subject; it is innate. He argued that belief functions to help an individual sort out a sane sense of reality, a social sense of reality. In Winnicott’s model, the social environment is helpful, tolerant, and welcoming; it might even share the illusion. His discovery that this sorting out happens largely during early childhood led him to advocate for more devoted parenting in order to increase the population of well-adjusted adults (and decrease the population of maladjusted egomaniacs, sociopaths, and other dysfunctional people), which would inevitably produce a more just society. Winnicott’s bottom-up and Bourdieu’s top-down analyses are complementary; both agree illusory belief is a necessary aspect of social life, allowing us collectively to work out what is real, while also not taking that reality for granted. Without illusory belief, then, we cannot build and rebuild a shared reality. Which is exactly why institutions are set up to protect illusory belief. Yet illusory belief is also vulnerable to being co-opted by those who claim to be its guardians. Preservation institutions are now ubiquitous. From a handful of countries in the 19th century, most nation-states and municipal governments have by now established effective bureaucracies for the preservation of cultural heritage. A well-organized system of international nonprofits can fill the void when a nation-state lacks capacity. Many private sector institutions have also been organized around the protection of particular objects, from neon signs to modernist buildings. Many aboriginal and native groups have created their own independent organizations. Heritage is now commonly described as a human right, a pillar of intergenerational equity, the basis of a more just society. That almost every aspect of heritage, tangible or intangible, is now institutionalized attests to the widespread recognition that illusory belief is vital for society. Heritage is now understood as a human right, a pillar of intergenerational equity, the basis of a more just society. In recent years this institutionalization has sparked justifiable criticism, especially in academic circles. But these critiques have not challenged the phenomenon of illusory belief itself, no doubt in deference to the communities who supposedly believe the illusion. But as Winnicott’s work reminds us, a successful social environment enables us not only to experience an illusion but also to frustrate it. And here is where too many preservation organizations fall short; in their devotion to traditional practices and their over-protectiveness of objects, they cut short the process of experimentation and, worse still, co-opt their capacity to make legitimate claims on the larger social reality. For this reason experimental preservation now plays a crucial role in contemporary culture. Experimental preservationists gently frustrate and subvert illusory belief by choosing, as heritage, objects that have appeared too imaginary, too fantastic, too subjective to be understood as real heritage. By insisting on the illusory nature of heritage objects, experimental preservationists are opening up new and vital questions about the reality of heritage as an open-ended process of social negotiation. This is the powerful potential of “not-me” creations: to return heritage to its experimental sources, to the work of gathering objects that question our illusions and thus sharpen our understanding of the contemporary present and collective future. This essay is adapted from Experimental Preservation, edited by Jorge Otero-Pailos, Erik Fenstad Langdalen, and Thordis Arrhenius, and published this month by Lars Müller Publishers. It appears here with the permission of the publisher and the author. James Beck and Michael Daley, Art Restoration: The Culture, the Business and the Scandal (New York: W.W. Norton, 1993). John Richardson, “Crimes Against the Cubists,” The New York Review of Books, vol. 30, no. 10 (June 16, 1983), 32. See, for instance, Peter Cook, Experimental Architecture (New York: Universe Books, 1970). Laurajane Smith, Uses of Heritage (London and New York: Routledge, 2006), 29. Kropf and Strangeland’s method of working comes close to Golding’s “surface methodology” and also to David Gissen’s idea of “atmospheres” as an articulated realm extending between and through objects and subjects. See Manhattan Atmospheres: Architecture, the Interior Environment, and Urban Crisis (Minneapolis: University of Minnesota Press, 2014). This notion of “atmosphere” is being taken up within recent preservation discourse on adaptive reuse. See Hanna Katharina Göbel, The Re-Use of Urban Ruins: Atmospheric Inquiries of the City (New York: Routledge, 2015). See Lucia Allais, “Will To War, Will to Art: Cultural Internationalism and the Modernist Aesthetics of Monuments, 1932–1964,” PhD dissertation, Massachusetts Institute of Technology, 2008; and Lucia Allais, “Integrities: The Salvage of Abu Simbel,” Grey Room 50, Winter 2013, 6–45. See also Carolyn Riccardelli, et al., “The Treatment of Tullio Lombardo’s Adam: A New Approach to the Conservation of Monumental Marble Sculpture,” Metropolitan Museum Journal 49 (2014), 48–116. Before Ramberg’s project, the Berlin Senatsverwaltung für Stadtentwicklung (Senate Department of Urban Development), under the direction of Hans Stimmann, had already drafted plans to demolish the Palast der Republik to make way for a half-replica of the Prussian royal winter palace. Zweifel gave voice to a public that the state had decided to ignore. A measure of the project’s success was its abrupt termination in 2007 by the Senatsverwaltung für Stadtentwicklung. See Adrian von Buttlar, “Berlin’s Castle Versus Palace: A Proper Past for Germany’s Future?,” Future Anterior 4, no. 1 (Summer 2007), 14. Many experimental preservationists have worked with plaques. In the 1990s, for example, the REPOhistory collective installed traditional-looking signs with untold and often shocking histories (such as slavery) associated with buildings in Manhattan. See Mervyn Rothstein, “Lower Manhattan Journal: Signs of Olden Times Bring History to the Streets,” The New York Times, June 25, 1992 (accessed February 10, 2016). Pierre Bourdieu, “Principles for a Sociology of Cultural Works,” in The Field of Cultural Production: Essays on Art and Literature, ed. Randal Johnson (New York: Columbia University Press, 1993), 178–81. Michel Serres, The Parasite, trans. Lawrence R. Schehr (Baltimore: Johns Hopkins University Press, 1982), 226. It is important to emphasize that the radicalism of experimental preservation does not stem directly from these precedents; it is neither a return to sources nor an attempt to search for the new by reviving past practices. In this sense, experimental preservation is unlike 1960s artistic neo-avant-gardism, which mainly focused on the recovery of historical forms, emptied of their original political content, and which provoked much art critical debate during the last quarter of the 20th century. Hal Foster famously argued against Peter Bürger’s canonical Theory of the Avant-Garde (1974) that the neo-avant-garde was not a meaningless repetition of the past but rather a method of reviving past practices that could critique the present. See Hal Foster, “Who’s Afraid of the Neo-Avant-Garde,” in The Return of the Real: The Avant-Garde at the End of the Century (Cambridge: MIT Press, 1996), 1–32. See, for example, Robert Hewison, Heritage Industry: Britain in a Culture of Decline (London: Methuen Publishing, 1987); or Medina Lasansky, The Renaissance Perfected: Architecture, Spectacle, and Tourism in Fascist Italy (University Park: University of Pennsylvania Press, 2004). John Ruskin, The Seven Lamps of Architecture (London, 1849), 180. Historians have long claimed to be the ultimate authority on the value of objects, and tend to mistrust preservationists’ handling of evidence. This power dynamic is institutionalized in national bureaucracies. Italy’s Istituto Centrale del Restauro, founded in 1939 by historians Cesare Brandi and Giulio Carlo Argan, was instrumental in codifying preservation aesthetics into a visual language of markings legible to historians, such as tratteggio, the convention that an object’s lacunae be in-filled with strictly parallel brushstrokes to distinguish the hand of the preservationist from the hand of the original creator. As with church doctrine, the preservationist’s confession facilitates institutional policing. For Ruskin, “honest” preservation meant not touching the historic building in the first place. The preservationist must resist the urge to touch the holy object. But if one had to touch, then Ruskin insisted that the body of the building be touched “naturally,” with conservation treatments that would slow nature’s decay rather than restoration treatments that would reverse decay — and thus violate the laws of God and nature. Not every preservationist subscribed to these strict ethics. The British architect John Loughborough Pearson (1817–1896), surveyor of Westminster Abbey, flaunted his ability to hide his interventions. He considered Saint Pancras Church, at Exeter, to be his masterpiece because the building fooled not just the untrained public but also the high priests of architectural history into believing they were in the presence of the untouched original. See Anthony Quiney, John Loughborough Pearson (New Haven: Yale University Press, 1979). Pearson took perverse pleasure in agreeing with his worst critics, the Ruskinians of the newly formed Society for the Preservation of Ancient Buildings, who accused him of falsification. See The First Annual Meeting of the Society: Report of the Committee (London, 1878), 30. With the rise of climate science, the weather ceased to be considered an Act of God. See Peter Moore, The Weather Experiment: The Pioneers Who Sought to See the Future (New York: Farrar, Straus and Giroux, 2015). See Bill McKibben, The End of Nature (New York: Random House, 1989). Fredric Jameson, “Nostalgia for the Present,” in Postmodernism, or, The Cultural Logic of Late Capitalism (Durham: Duke University Press, 1991), 287. Laurajane Smith, Archaeological Theory and the Politics of Cultural Heritage (London: Routledge, 2004). Bosnia and Herzegovina is unlike traditional Western national states. A bureaucratic invention of the Dayton Agreement, it incorporates two “entities,” the Republika Srpska and the Federation of Bosnia and Herzegovina, as well as the Brčko District, which officially belongs to both but is governed by neither. As a result — as Akšamija’s project makes clear — the state cannot be relied upon for the preservation of cultural heritage. Traditional preservation discourse in the Anglo-Saxon world has drawn much if its inspiration from Arts and Crafts figures such as William Morris and William Richard Lethaby. See William Richard Lethaby, Architecture, Mysticism and Myth (London: Percival and Co., 1892; reproduced. 2004). The influence of Lethaby in the interpretation of the Ise Shrine is especially evident in Western textbooks like Kenneth Frampton, Studies in Tectonic Culture: The Poetics of Construction in Nineteenth and Twentieth Century Architecture (Cambridge: MIT Press, 1995), 14–17; and John H. Stubbs, Time Honored: A Global View of Architectural Conservation (Hoboken: Wiley, 2009), 33, 267, 276. The museum was reopened in 2015 thanks to funding from the U.S. Embassy. Donald Winnicott, “Transitional Objects and Transitional Phenomena (1951),” in Collected Papers: Through Paediatrics to Psycho-Analysis (London and New York: Basic Books, 1958), 239. Symptomatically, it is still appears in the World Heritage List, but it is listed sous rasure as Dresden Elbe Valley. Pierre Bourdieu, “The Structure of Sentimental Education,” in Field of Cultural Production, 159. Jorge Otero-Pailos is Professor and Director of Historic Preservation at Columbia University’s Graduate School of Architecture in New York.